This May, 54-year-old useless-gizmo salesman Jeff Peckman has been pressing the Denver city council to approve a ballot initiative that would allow voters to OK an Extraterrestrial Affairs Commission. This proposed 18-member panel would be allotted $75,000 a year to prepare Denver for contact with intelligent beings from space (and/or their vehicles). If he can obtain 4000 signatures from Denver residents, the proposal will have to go before voters. Peckman is convinced that the federal government has been concealing evidence of alien activity with taxpayers’ money. Unfortunately for him, however, he didn’t have any concrete proof to back this up – until now. 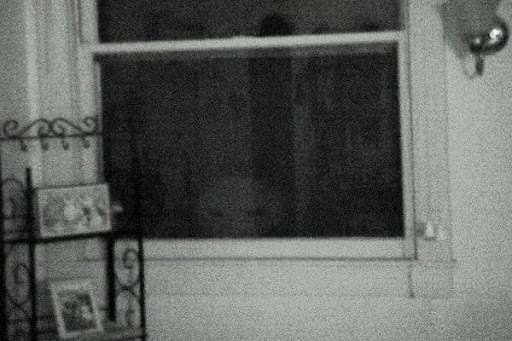 Last week Peckman announced that a Nebraska man named Stan Tiger Romanek had managed to film one of the little buggers peeping through his living room window in 2003, and that they would release the footage to the media today. This was announced on the Coast to Coast AM radio show and to Denver media. But today Peckman released just a solitary, black-and-white, grainy still (pictured) from the purported video, explaining that the real deal will be seen only in an upcoming documentary. Is Peckman a champion of ET-human cooperation? Or a manipulative PR nut trying to promote yet another direct-to-DVD UFO documentary? Let’s let the city of Denver decide, and forget all about this schmuck. Peckman’s commission concept, though unique, is just one small part of an international movement of “exopoliticians” who are pushing for full government disclosure of information about UFOs and ET life, designing plans for safe and productive ET-human contact, and proposing inititiatives that they believe will promote intergalactic peace and harmony. Exopolitics is not new (Steven Greer’s Disclosure Project has been active since 1993), but it came to new prominence with the 2000 release of the book Exopolitics: Politics, Government and Law in the Universe by this fellow, a Yale-educated lawyer who believes ETs are already roaming the planet in human guise (I won’t use his name; he likes to Google himself, then post ranting comments about aspartame and other “war crimes”). Other proponents of exopolitics include scholar Michael Salla (founder of the Exopolitics Institute), former Canadian Defense Minister Paul Hellyer, and actor Dan Ackroyd. This entry was posted in UFOs and tagged alien abduction, aliens, media, TV. Bookmark the permalink. Aw c’mon! Don’t you want another AW rant on here? After all, he’s THE big cheese in alien relations. ;)Who films home videos in B&W? Could it be because B&W is so much easier to Photoshop? Hmmm…. Very good point…why did he film in B&W? Supposedly the alien blinks and looks around, so people are guessing it’s a puppet.